Over the past few months, children at Rosary School Age Care program have been exploring the concept of social justice, and thinking about what it means to them. They began by brainstorming a collection of ideas, and displayed these on a on a poster to share with other children and families. After learning about the St Vincent de Paul CEO Sleep Out, they starting thinking about ways they could make a difference to the lives of people in the community, particularly in the freezing cold Canberra winter. They decided they would collect second hand items, and donate them to clients who are supported by the YWCA Canberra Housing Support Unit, as well as other people in need. 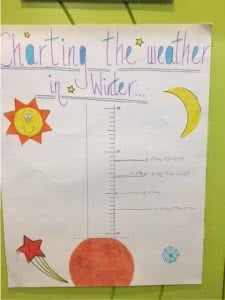 Children also began monitoring the weather patterns and keeping a record of the temperature using a chart. To finish up our project we invited a representative from the YWCA Canberra Housing Support Unit to come and collect the boxes that we had so lovingly put together. This was a very enjoyable and rewarding experience for children and educators, and they were pleased to be able to make a positive impact.